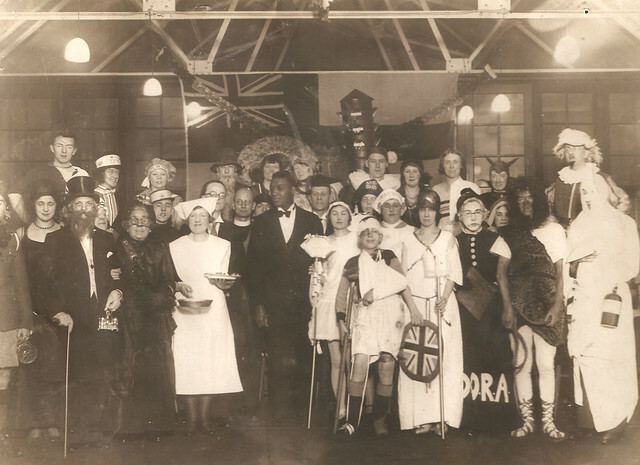 During the recent Memories of Leicester course at St Chad’s church we found this photograph, labelled ‘Fancy Dress Carnival Shrove Tuesday 1932’, among some boxes of historical documents. The fancy dress is interesting in itself. While it’s obvious what some of the costumes represent, others are more of a puzzle, like the lady with D.O.R.A. on her dress. We think she might have represented the Defence of the Realm Act passed in the First World War. She looks stern enough; but still more interesting, the photo turned up a local connection with the boxer Larry Gains, to the right of the vicar in the centre, who seems to have been called in to do the judging! Larry Gains was born in Canada in 1900 and made his first professional appearance in Britain in 1923 in London as ‘The Toronto Terror’. He later moved to Leicester and trained at the gym over the Jolly Angler pub in Wharf Street. He won 17 of the the 18 fights he had in Leicester from 1930 to 1937, including that in June 1931 against Phil Scott, heavyweight champion of the British Empire, at the Tigers’ ground on Welford Road. It was a short fight, in front of a crowd of around 34,000, ending with a knockout in the second round. ‘Gains was his master, temperamentally and as a boxer…’, the Leicester Mercury reported on 15 June 1931: ‘Gains feinted, hooked the left to the jaw, followed similarly with the right, and then flashed across the finishing punch – another right… At seven Scott was struggling, at nine he was on one knee and was feebly attempting to rise “not out”…’. So what was his connection with the Coleman Road area of the city? One of the people who came on the course told us that Larry Gains lived in Thoresby Street, and his son and daughter attended Coleman Road School. He was often to be seen running up what was then Cut Throat Lane – later Coleman Road – with his trainer on a bicycle, ‘shadow boxing’ with him as well; and after beating the Italian Primo Carnera at White City in 1932, he treated all the local children to an ice cream from a local Italian vendor. He joined the Royal Air Force in World War II as a Physical Training Instructor, and later moved away from Leicester – but thanks to the photograph we now know a little more about his time here. *The quote is from Wharf Street Revisited by Cynthia Brown, where there is more information on Larry Gains and a photograph of him with his wife Ilse and children Harold and Otty. This was published by Leicester City Council in 1995 and is available in local libraries.